Pen and ink drawing depicting a scene at a fair in Dublin. In the foreground, various fights are breaking out between groups of men. In the background are banners for fairground attractions including a pair of giants, a Chinese juggler, and a horsemanship show. 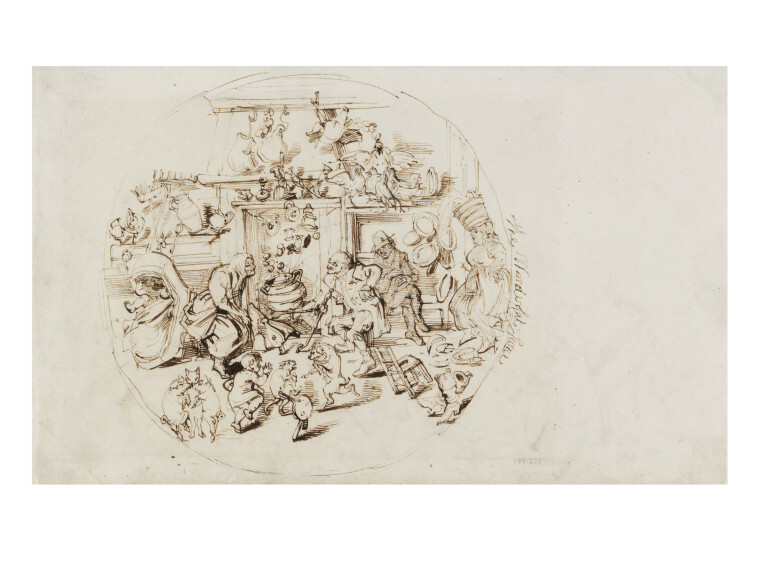 On the reverse is another drawing entitled 'The Wonderful Tune' (F.88:286). 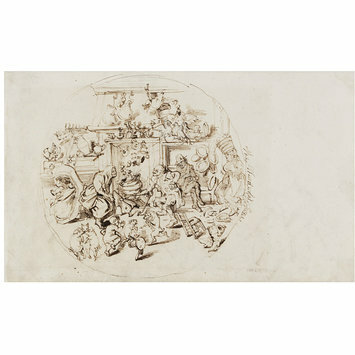 Drawing by Daniel Maclise depicting a scene at Donnybrook Fair, Dublin. Ireland, ca. mid-19th century. On the reverse is 'The Wonderful Tune', numbered as F.88:286. Pillar stand of thirty frames, containing three hundred and ninety drawings and sketches in pencil, pen and ink, and colour - figures, landscapes, etc. There are also seven by other hands (aside from Maclise) - Calderon, T.S. Cooper, Cope, Herbert, and Landseer, all R.A., F. Danby, A.R.A., and G. Cattermole. 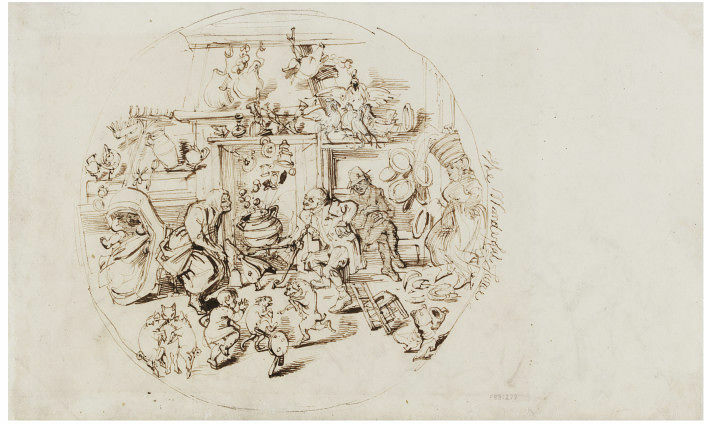 These drawings and sketches include the following celebrated persons, amongst whom were several more of the Gallery of Illustrious Literary Characters: C.J. Apperley, Sir Egerton Brydges, Edward Bulwer-Lytton (Lord Lytton), G. Cattermole, Sir Alexander Cockburn, Joshua Cristall, Benjamin Disraeli (Earl of Beaconsfield), M. Faraday etc.